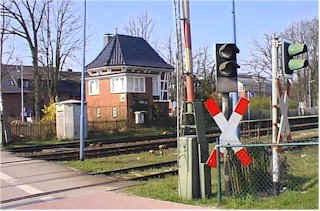 The level crossing in Bargteheide in the year 1999. Behind you can see the old "Bw" signal box which is now out of use. Note that the street signals are made of railway signal devices, modern installations use ordinary traffic light devices (although with only the amber and red lamps). 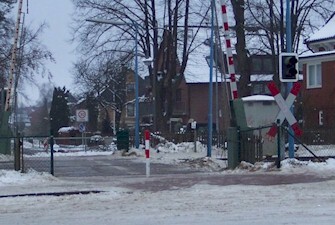 For a U.S. level crossing, look here. The same spot a few years later: The crossing was closed to motor traffic, and the street signals were replaced by standard (red/yellow) stop lights. 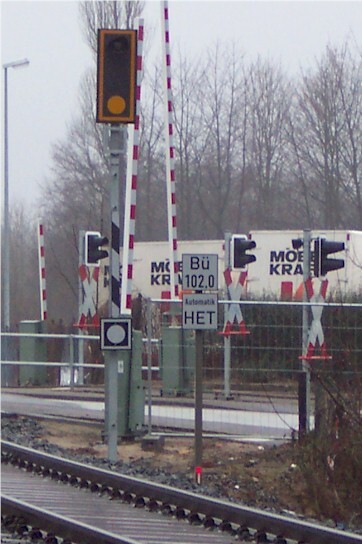 A DB protection signal for a level crossing. The white circle below the post plate indicates that this is a repeater signal. In DR area the red blinking light is mounted in the centre of the St. Andrew's cross. The red device between the lower legs of the cross is a bell ringing when the crossing is closed. 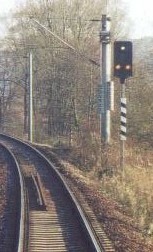 A DR protection signal for a level crossing. Note that the signal is working (the amber lights are on) while the rails have been completely removed during construction works! 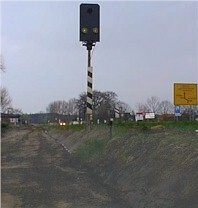 Another DR protection signal displaying aspect Bü 1: The crossing is secured. A DR Ra 10 board (the DB variant has an inscription). Also to the immediate right of the board's post you can see an So 14 attention pole. A So14 attention pole. 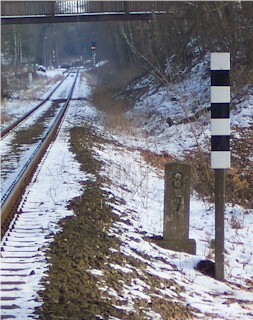 Marks the location of the contacts which activate the level crossing signals. 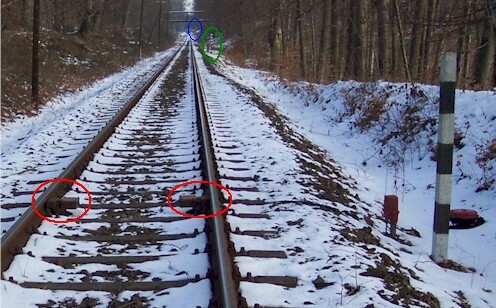 The large picture shows the location of the contacts (red circles), the So 15 warning board (green circle) and the So 16 signal (blue circle). A close-up of the So 15 warning board: Advancing a protection signal, check So 16's aspect now, brake if no white light present. An almost western-style signal in DR (eastern) area: Instead of two amber lamps two retro-reflective dots are used.